This is one of my all-time favorite pictures. It’s a picture of my wife, Lana, giving our oldest daughter, Karis, one big last kiss before sending Karis “off to school” for the first time ever…at age 19! Since Karis was homeschooled from kindergarten through high school, we had never sent her off to school before. But when Karis decided to move 4 states away to Virginia for her sophomore year of college, we finally got to experience it. So I turned around and drove back towards home. 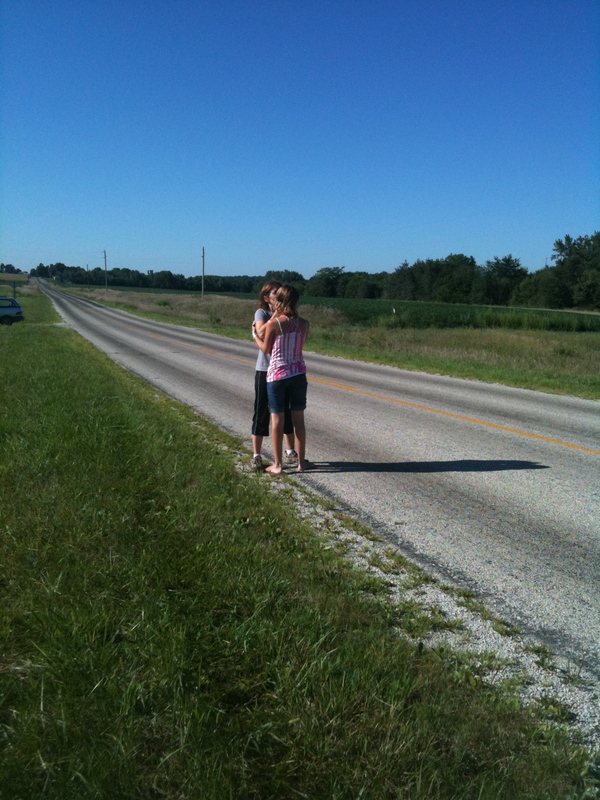 Lana met us half-way, still crying, and pulled over on the side of the road. She jumped out of the van and ran to give Karis one big last kiss. It was one of the sweetest moments I’ve ever seen in my life. Looking back on that picture now, I’m so thankful I turned around that day, and so thankful that Lana wanted me to. I had no idea that 18 months later Lana would be diagnosed with terminal cancer, and 9 months after that she would be gone. As hard as it’s been to lose Lana, memories like these remind me of the legacy Lana left us. Her life was filled with love for me and the for kids and for those around her, and that love still helps to fill the holes in our hearts that were created when she passed away. Some people, because of their great love for others and the investment they’ve made in their lives, leave a legacy when they die. Others, because of their lack of love or the abuse they’ve doled out to others over the years, simply leave a vacancy. It’s much easier to fill a hole in your heart that’s already been filled with love, than to fill a hole in your heart that’s been empty for years. Thankfully God can fill both kinds of holes, because His love is limitless! But I’m thankful, too, for Lana’s love, as it has helped me through so much of this past year without her. It inspires me to want to leave a legacy when I leave this life as well. As we come to the end of 2013, and as I’ve come to the end of this first year without Lana, I can honestly say I’m looking forward to the New Year ahead. I feel that God has many more things for me to do in my lifetime, and I want to make the most of the days I have left. Two weeks ago, my daughter Karis turned in her final paper and graduated from college with a 4-year degree in biblical studies. Two weeks before that, my second oldest, Lucas, walked across the stage at his college graduation, graduating with a 3-year degree in worship in leadership. And next May, my third oldest, Makari, will graduate with a 2-year degree in transformational ministry with a focus on acting. As much as I wish Lana were here to see these milestones herself, I can’t help but be thankful for all the fruit that her years of labor and love have brought forth. “‘Love the Lord your God with all your heart and with all your soul and with all your mind.’ This is the first and greatest commandment. And the second is like it: ‘Love your neighbor as yourself.’ All the Law and the Prophets hang on these two commandments.” (Matthew 22:37-40). I want to leave a legacy in the future, not a vacancy. Of all the goals I could set for myself in the New Year, this one inspires me the most. I pray it inspires you, too. Father, thank You for helping us through 2013, and I pray that You’ll help us through 2014 as well, with love in our hearts for You and for others, so we can leave a legacy of Your love everywhere we go. In Jesus’ name, Amen. P.S. One of Lana’s many legacies was to inspire me and help me to write the story of St. Nicholas that I shared with you during the weeks leading up to Christmas. Many of you have asked me if you can get a copy in print to read over again in the years to come, or to pass it along to others who might be interested in the story. So on Christmas Eve, I published the book on Amazon, and you can now get a copy in print! In addition to buying it directly from Amazon, there are two other ways you can get a copy. 1) Just make make a donation of any size to The Ranch, we’ll be glad to send you the beautiful paperback version of the book as our way of saying thanks. OR 2) Just post a 1-2 sentence review of the book on Amazon.com, then send us an email with your name, mailing address and a link to your review, we’ll be glad to send you a copy of the paperback for at no cost whatsoever! Your reviews help us get the word out about the book, and that in turn helps us to get God’s Word out to even more people. I’ve already had several people take me up on both offers. The donations are a blessing, especially as we come to the end of the year, and the reviews that people are leaving on Amazon are super helpful in passing Lana’s legacy on to even more people. I’ve included some of the reviews below so you can take a look, too. Thanks again for your love and support throughout the year, and for helping us to get God’s Word out to even more people!